The Washington State University Madrigal singers and Concert Choir held a choral exchange concert Sunday with local music group Camarata Music Company. 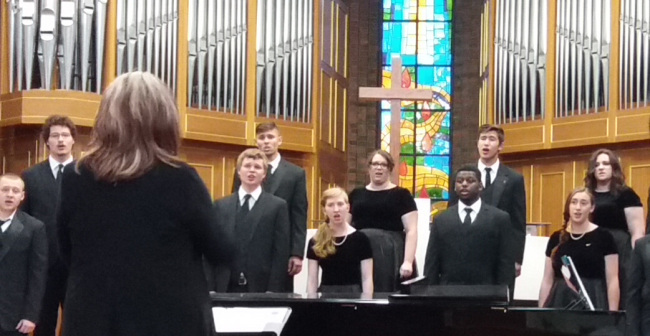 The U.S. Choir is in Korea as part of a performance tour of Washington and South Korea and contacted the local group, performing at the Chung-dong First Methodist Church in central Seoul. The concert had an informal tone, with the WSU conductor Lori West seemingly picking pieces on the fly from a set repertoire. But the music was no less polished, as the Madrigal Singers moving smoothly between 20th and 16th century pieces without a noticeable switch of mood. The WSU Concert Choir specializes in 20th-century work, but there was plenty of contrast, moving from Jake Runestad’s almost playful handclap-punctuated “Alleluia” to the somewhat eerie selection from “The Deepness of the Blue,” a set of choral settings of Langston Hughes poems by William Averitt. The CMC Chorale closed with a work from Mozart’s Requiem. Some members were struck down by illness, conductor Ryan Goessl said, but the performance did not seem to lack body for it. The WSU Madrigal singers and Concert Choir moved on to Ansan, Gyeonggi Province, for their next stop and concludes its tour Thursday.